Anybody who wants to help infertile people! It was designed in the first instance for healthcare workers, but others who want to make a difference in the lives of infertile people may also find it useful. The Toolbox is available in hard copy but also an electronic version for computers and mobile devices. What’s in the Toolbox ? There are 3 levels of Tools. The Basic Tools™ contain information that is purposely succinct--just a simple statement or brief summary of the Daisy and each of the six Pyramids of Action. The Basic Tools are coloured orange. The Support Tools™ provide more information and detail so that you know what to do to take action. Support Tools are coloured green. The Reference Tools™ are lists of references that provide evidence for the information and recommended actions in the Basic and Support Tools. Reference Tools are coloured white. The Glossary provides definitions and explanations of abbreviations and acronyms and is coloured white like the References. By colouring the Levels icons this way, you can always tell whether you are using a Basic Tool, Support Tool or Reference Tool. Below is The Levels Pyramid™ which shows how the Basic Tools, Support Tools and Reference Tools relate to each other. You can click on the Levels arrow at the top of the page to take you to The Levels Pyramid where you can choose the level you want to work in by clicking that level. You can also choose your level by clicking on The Levels Pyramid icon at the top of each page. With the exception of the Daisy (Tool 1), all tools have the shape of a pyramid. 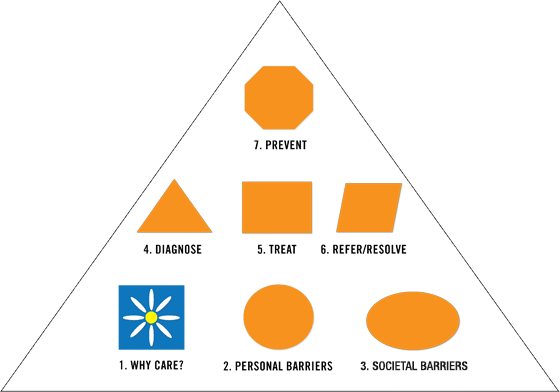 Actions that can be taken in low-resource settings are at the base of each pyramid. These actions are often simpler, more elementary, involve fewer people and are low-cost interventions or opportunities. As you move higher up in the pyramid, generally more resources are required to take actions that are usually more complex. You can think of it as a kind of ladder—as you climb higher, it usually gets a bit more complex or complicated. However, sometimes or in some situations, it might also be easier higher up on the ladder, and the elementary aspects might be those most challenging. You should do whatever you can do at any level in any of the Tools in The Actions Pyramid. You can click on the Actions arrow at the top of the page to take you to The Actions Pyramid where you can choose the Action you want to work in by clicking the Tool and then the Action in that Tool you wish to do. You can also choose your Action by clicking on The Actions Pyramid icon at the top of each page. 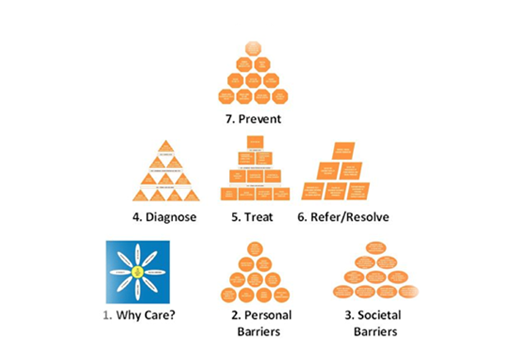 Higher resource and More Difficult Actions are towards the top of each Tool Pyramid. Lower resource and Easier Actions are towards the bottom of each Tool Pyramid. The one you think will work best for you. Doing something is better than doing nothing. There is no right or wrong way to make a start. Then, if you want to do more, you can choose other Tools or individual aspects of other Tools to build on what you have already achieved. Or, if you want to be very systematic and are very committed you can start with Tool 1 and work your way through the entire Toolbox . What if I can’t implement some of the recommendations? Then drop it and move onto something that you can do or implement. No single component of the Toolbox is so essential to helping infertile people that your efforts will fail if you can’t apply it. Using even one or two Actions in one or two Tools may make a difference. What if I want to adapt a Tool? Just do it! The Toolbox is made to be adapted so that it can work in any type of healthcare setting anywhere in the world. You know what works best in your situation. Never stop caring and trying to help. Email us at fertilitytoolbox@figo.org. We would love to hear from you about what you like and what works in the Toolbox and what doesn’t. 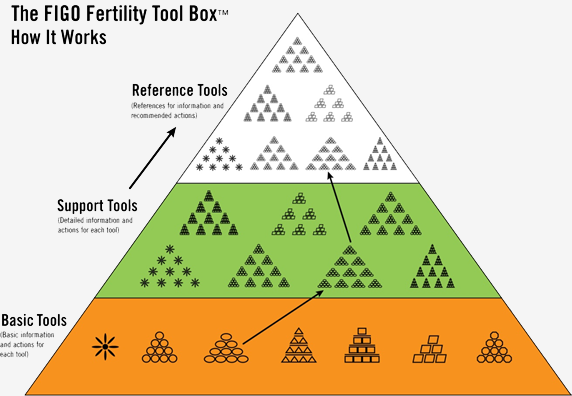 We hope to constantly improve The FIGO Fertility Toolbox ™ to make it a better Tool to help you tackle the disease/disability of infertility.